10 visit pass- only $8 per visit! Save up to $4 depending on day of visit. This multi-visit pass is not child dependant. The perfect Gift! 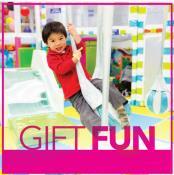 Gift cards can be used toward any activity or product at WiggleWorks kids Bellevue! Buy online and we'll ship it for free to you or your recipient. 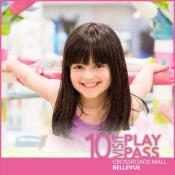 Monthly Play Pass entitles one child to unlimited admission from time of purchase to the last day of the month. 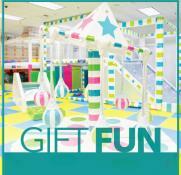 Terms: No additional discounts apply, only usable at WiggleWorks kids Bellevue. Not eligible for refund after first visit OR two weeks after purchase. 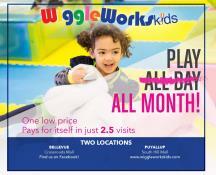 Terms: No additional discounts apply, only usable at WiggleWorks kids Bellevue. Unlimited Play Pass is not eligible for refund after first visit OR 2 weeks after purchase. During purchase, please note which month you are purchasing the pass for.